So you've implemented Salesforce. Now what? With such a robust platform at your fingertips, it's easy to feel overwhelmed after go-live. At Silverline, we know that any project is only as good as its planning and destinations are best reached with a roadmap. 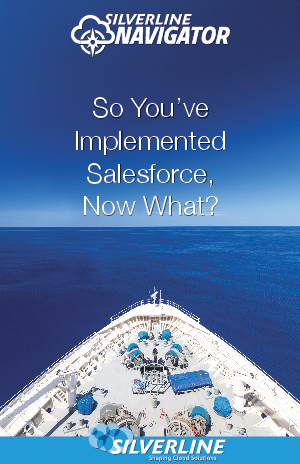 Our Navigator solution provides access to industry-leading experts ready to help you get the most out of Salesforce. With deep industry knowledge, an agile approach, and quarterly business reviews, we ensure you’re getting maximum value out of your org in the short and long term. Our ultimate goal is to help your business thrive, while we steer you in the right direction — so you can focus on championing (and enjoying) your new Salesforce org. Let our custom approach to your specific needs be the North Star that keeps you from being lost at CRM.